These days there’s no such thing as “Perfect App” as with time, mobile applications are optimized for extending the scope of their functionality. 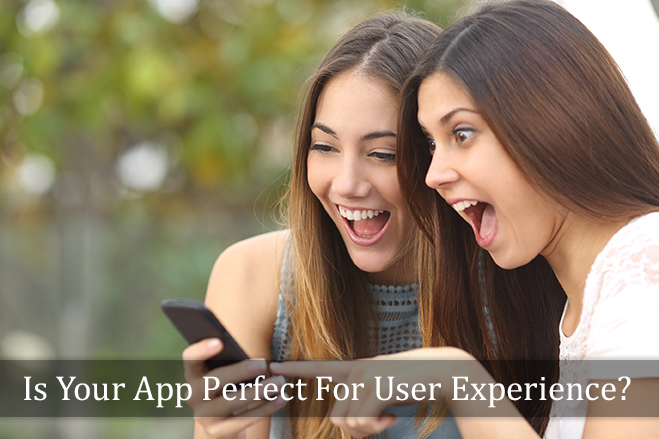 The perfect app is one which continues to exceed user expectations by creating an intuitive and engaging user experience with time. Owing to this, businesses have realized that user experience is the true competitive advantage one can have over others and that’s why they are spending most of their time in mobile app development services to capturing and retaining users. Time flies and if the visual design or interface of your app is not in line with users demand, then users will fly i.e. they would refrain from using the app. The mobile app interface has a significant impact on user’s experience, therefore, should be carefully considered. Why is User experience crucial? User experience (UX) focuses on usability and how your app responds. Your app interacts with users and greatly determines the degree to which users perceive your application. The aspects such as ease of usage, utility and efficiency should be dynamically modified with respect to time to be in sync with the users’ requirements and usage circumstances. In simple words, it may be considered subjective in nature to the degree that changes users perception and behaviors, during and after accessing your app. It is imperative not to fail this segment of mobile app development as the interface of your app determines how users think about it and how they behave towards it. Try these tips to improving the user experience and improve user engagement and optimize performance. iOS menu is at the bottom, Android at the top. iOS design is mostly flat while Android’s design is dimensional. Observe some common apps that have been made for both the platforms and you’ll notice the difference and how they are perceived by the users. The functionality is same but the presentation is different owing to the platform conventions. If you’re developing for both platforms, then have access to both Android and iOS devices and get a good sense of the subtle differences. You can also go through Apple iOS Human Interface Guidelines and Android Design page. Before you need certain data, we recommend asking for it first, such as when the user clicks on “share post” and then is prompted for a permission for access to a social media account. Most of the apps ask to feed personal information like email id, location, social media accounts etc., therefore, effectively request for the permission and not to jump the gun. Always justify your reasons why your app needs certain information. The navigation guides users through your app and should be clutter free. It should be clear and well-structured with consistent throughout the app. Navigation acts like a map guiding to all the different areas and information contained in the mobile app. If it is intuitive and clear, then users will stay, generating more leads. But, you need to keep in mind that one size does not fit all the strategy and you have to rectify so that the app’s navigation helps in achieving your objectives. Users are a great critic and can tell you what is wrong with your app. Whether it is app crashing, response time, missing features or anything, they can notify you and review your app. This way you know where you have to work upon to making your app the perfect one. You have to remember that not everyone likes to review a product but love to read, so ask them upfront and get their opinions. For instance, you can read all the reviews of the similar app in App Store or Play Store and get an idea where you lack. It’s a decent plan to check the number of clicks a user has to make to perform a task. The more is the number, the fewer visitors your app will receive. Try to reduce the number of clicks so as to making the process a bit faster and smoother, particularly for frequently performed tasks such as accessing contact form, about us section, services, product description etc. Streamline your processes to increase sales and retention rates. User experience is an important aspect of your overall strategy and while you focus on the core competencies of the app, you should keep an eye on the details of the user experience. UX is not just about design but about creating a positive user experience which eventually leads to a perfect app.